You need not ever step into a freezing cold or sweltering hot vehicle again. Sound World Green Bay expertly installs remote car starter systems year round. Start your vehicle with the push of a button and let it achieve optimum interior temperatures before you get behind the wheel. 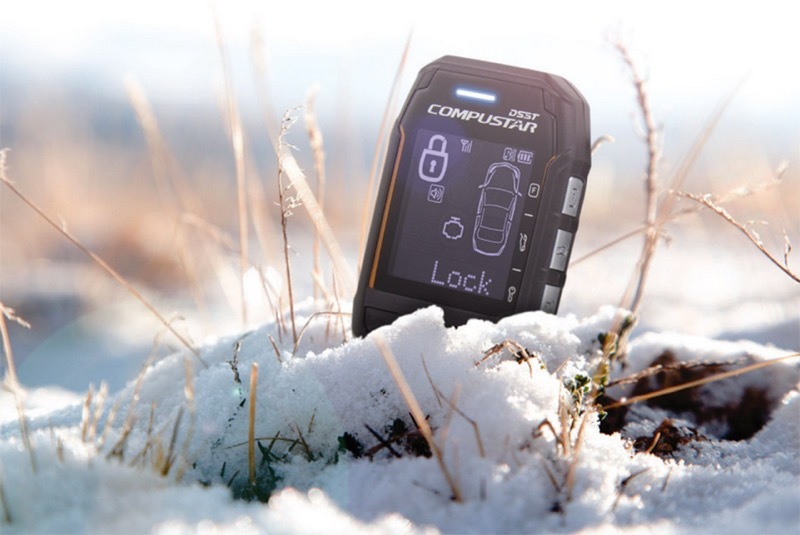 We are one of a select few Compustar PRO series dealers with a full line of remote car starter solutions to fit every need. Whether you drive a European luxury vehicle, lifted truck, a vehicle with keyless ‘push-to-start’ button ignition, Hybrid gas-electric vehicle or anything else with wheels, Sound World has a remote car starter solution that’s ideal for you. Sound World Green Bay developed a uniquely client-focused policy that puts peace-of-mind into any remote car starter purchase; it’s called the Honest Price Quote. Our Honest Price Quote System came about a few years ago in response to hearing repeatedly about prospective clients who visited other shops in the area and were told one “low” price, but were charged drastically more, sometimes hundreds more, when picking up their finished vehicle. We’ve spent countless hours researching and documenting every remote car starter installation we’ve completed over the years. When clients contact us for a remote starter, we know exactly what’s needed to complete the installation in your vehicle’s specific year, make and model. Should you have a newly released model year vehicle, we have a rigorous qualification process that ensures a guaranteed price when you’re quoted. We make certain all of your costs are considered in an easy-to-understand, all-inclusive price. Labor – This covers our high-quality, professional installation. With every Honest Price Quote, the goal is to provide a comprehensive total cost that’s inclusive of everything needed to complete the installation in your vehicle. We’re so confident in this approach that we put your Honest Price Quote in writing. It’s part of how we do business; honest and trustworthy. Call us today for an Honest Price Quote for a remote car starter on your vehicle. Not only do we provide fair and honest quotes on remote car starters, we also have the expertise to deliver first-quality workmanship. This ensures your remote starter system functions throughout the season when you depend on it most. Our installation team employs industry-leading processes that preserve your vehicle’s factory warranty and ensure longevity throughout your ownership of the vehicle. If your vehicle happens to have remote starting capability as standard equipment, we can add smartphone control capabilities to it just as we have available to all of our systems. Multiple choices for remote control including use of your factory keyless entry fob, ultra-thin one and two-way keychain transmitters and the ultimate in long-range control; smartphone connectivity to remote start your vehicle anywhere in the world with a cellular signal. Combine your remote car starter with a vehicle security system all with a unified remote control. Adding a security system is a great choice for those parking in less than ideal locations. We have several comprehensive vehicle security approaches that help prevent both vehicle theft and theft of contents within the vehicle. Great products and all-inclusive pricing are a wonderful advantage for Sound Worlds clientele. What sets us further apart is our industry leading level of installation detail. We have an extensive database of vehicles on which we’ve worked including connection and component locations, cutting-edge integration techniques and even fully soldered wire-to-wire connections so that there’s no concern of weatherization compromising the installation. Our technicians have extensive training on vehicle wiring, disassembly and integration with existing on-board systems. We are innovative and creative when it comes to the ‘difficult’ vehicles on which other shops decline work because our expertise and installation quality ensures you’ll be happy with your purchase. In addition to our attention to detail in professional installation, we are proud to be a recipient of the Compustar Regional Dealer of the Year award for 11 years in a row. This exclusive award is given to the retailer with the highest customer satisfaction rating and lowest defect rating in a five state area. This is yet another confirmation your vehicle is in good hands with the installation experts at Sound World Green Bay. If you’ve never owned a remote car starter or haven’t experienced the latest control technologies like ultra-thin remotes, extended range and smartphone control, we have everything we offer on display and available for a complete demonstration at our Green Bay showroom. Try the options for yourself. See what you like. Get an Honest Price Quote and never enter an uncomfortable vehicle again. Call us at (920)499-4519 to schedule an appointment or feel free to visit us at any time for an in-person vehicle evaluation. We’ll explain all the functions and features available, help guide you toward what best fits your vehicle and needs, then we’ll provide you a written Honest Price Quote to back it all up. Once scheduled, we’ll have our team of expert technicians install everything with a high level of detail that preserves your vehicle’s existing safety features and warranty. Finally we take the time to personally demonstrate how everything on your new remote car starter works so you have peace-of-mind. We’re eager to show you just why we’re the experts.